When I saw Nigella on telly cooking lamb cutlets in a frying pan and then dumping some cooked potatoes into the oil left in the pan after the lamb was taken out, I knew I had to try it. But instead of mint, I thought that parsley, with its grassy undertones would work especially well with lamb. And we all loved it. 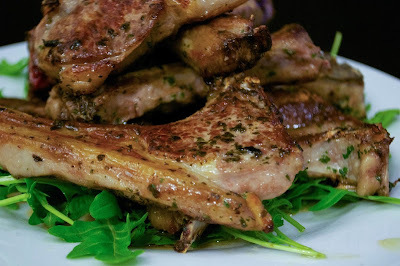 One of the things to remember if you want a decent amount of colour on your lamb cutlets, is to leave them alone while they're in the pan. That means no shifting, pushing or turning them over too soon. You'll end up with beautiful succulent, caramelised lamb. Also, because you're not adding any extra oil to the pan, it will look at first as if there's not enough. Don't worry, the fat will melt down and you'll have plenty to toss the potatoes into later. 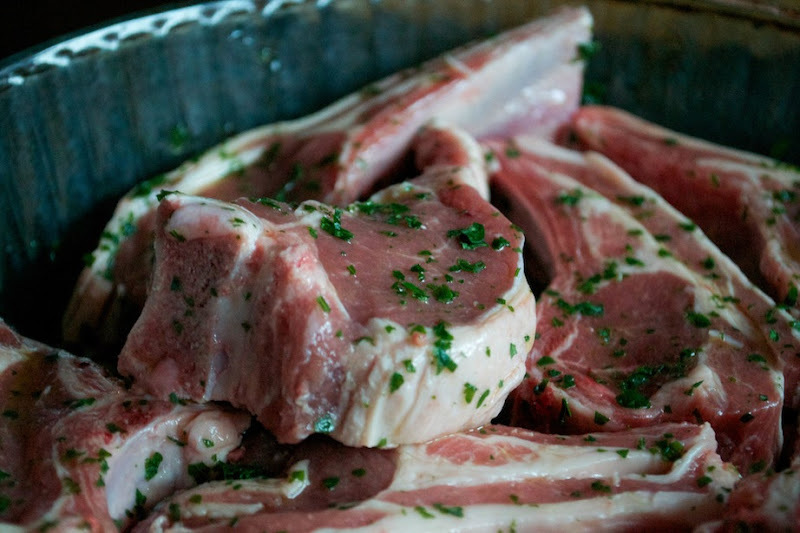 Arrange the lamb in a large dish and drizzle over the garlic oil and sprinkle over the parsley. Massage it all into the meat and leave for minimum 30 minutes or longer for the lamb to absorb the flavours. If you're leaving this for longer than about 30 minutes, keep it in the fridge. I usually leave it at room temperature if I'm cooking it within half an hour as the lamb will cook more evenly as well, if it's not fridge-cold. Arrange the rocket on a serving plate and put to one side. 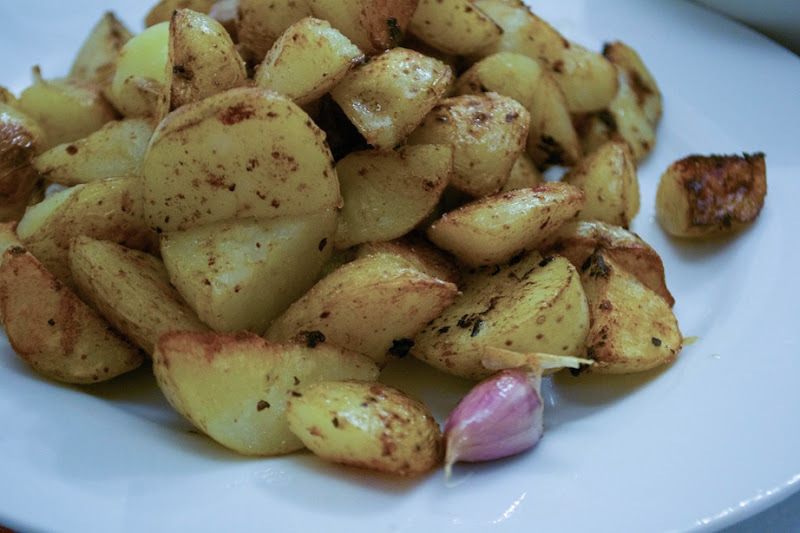 Put the potatoes on to boil in a pan of salted water, and simmer until they're just tender. Drain and leave to one side. 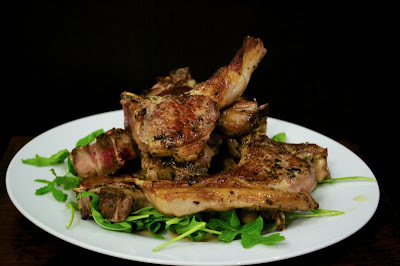 Just before you want to cook the lamb, season the cutlets with a good pinch of sea salt and immediately lay them out in a large, dry non-stick frying pan. Sizzle away on a medium to high heat for about 5 minutes. After they've had the first 5 minutes, turn them all over and continue to cook for another 3-4 minutes. This will leave you with lamb that's medium-well done, so adjust your timings if you want them more or less well done. Once they're cooked to your liking, tke them out with tongs and arrange them on top of the rocket leaves and leave them to rest. Next, get on with the potatoes. Keep the pan on a highish heat and dump the cooked potatoes into the pan you cooked the lamb in, along with a couple of unpeeled cloves of garlic. Leave these to sizzle away and turn golden - they'll absorb all the lamby flavours from the oil in the pan - and sprinkle in a little sea salt. Serve the lamb along with the potatoes and some greens - a perfect and very quick dinner for 4.